The biggest complaint that we’ve received about our book is that it doesn’t give enough ‘how-to’ advice. We’ve taken that to heart. So we spent the last two months digging into our young entrepreneurs and picking apart how they built 5-, 6-, 7-, 8-figure businesses from the ground up. What types of businesses are they in? How did they get started? What did they do to expand their fledgling businesses into mini empires? 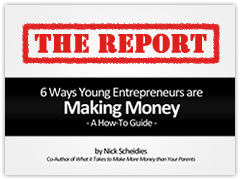 Nick and I found six consistent ways that young entrepreneurs are making money. But simply “finding out” wasn’t enough. So Nick wrote-up a free, 60-page how-to guide (don’t worry, it reads fast) that details the step-by-step processes that you can replicate to make money like these young entrepreneurs. Why Scheidies agreed to write this book without any interest in entrepreneurship and how he has 180-ed since. How to make a healthy income as a freelance whatever on the best freelance websites. How you need to sell thousands of books, then get published. How to become a professional speaker and actually get paid for it. How to make money online by selling other people’s stuff. How to get other people to sell your stuff online. How to create a gigantic online brand that’ll have larger brands knocking on your door. Why one drop of ___________ is better than an ocean of _____________. It’s very important to us that everyone receiving The Report actually wants it. Once you enter your email, you’ll need to confirm that you want to receive it by clicking a confirmation link. So check your inbox after you sign up.